Have you ever wondered what kind of Halloween costume you could put together if you had lots of money to burn, and didn’t start planning it on October 30? It would probably look something like this amazing Star Wars: The Return of the Jedi getup featuring a ‘working’ Speeder bike. The Speeder bike doesn’t actually float or fly, it’s actually built on a custom electric motorcycle chassis made by Super 73. 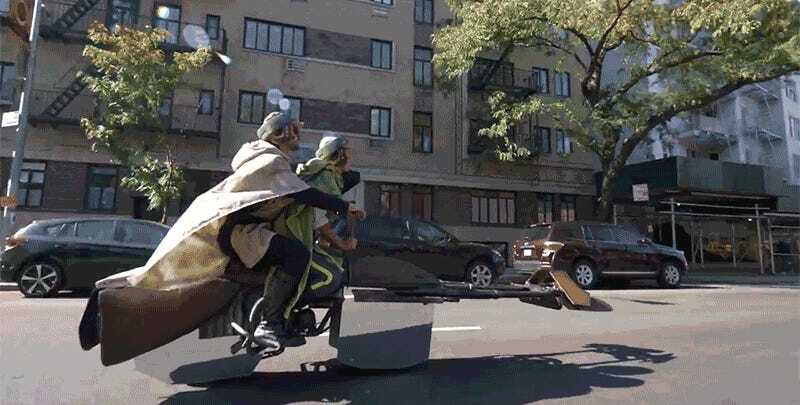 But a set of mirrors are used to camouflage the wheels as the bike rolls through Manhattan, and it certainly helps sell the effect. If you want to try building one for yourself, there’s also a behind-the-scenes video that reveals how the bikes and costumes came together, but you’ll probably need to start now if you want it ready for Halloween 2018. It&apos;s That Time of Year: The Start of the io9 Halloween Costume Show Is Here!